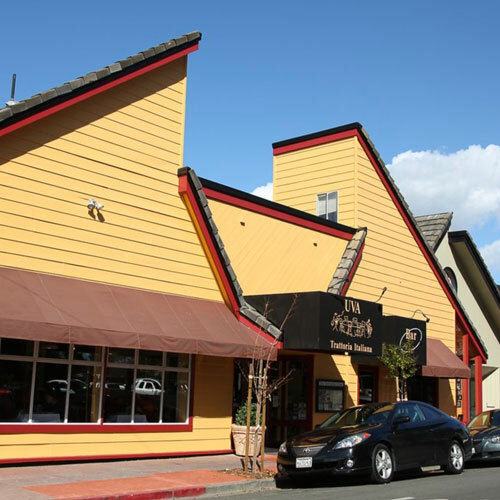 Uva Trattoria and Bar – Napa, Ca. I first heard of Uva Trattoria and Bar while shopping at Costco. They have discount gift cards for several dining establishments around the Napa area, including Uva. I also saw a deal on Groupon for a discounted lunch or dinner. People seemed to give it good reviews, so I thought we should give it a shot. The restaurant is located just off Main street on Clinton. It sits among several good restaurants including 1313 Main and Napa Bistro. When we walked in, the restaurant seemed pleasant and I was very happy that they chose to sit us in the window area so that I could take good photos of the food. The staff was friendly and it seemed as though it was gonna be a nice meal for the three of us. We had an out-of-town guest that day and our earlier lunch hadn’t been good, so I had my fingers crossed that this place would make up for it. 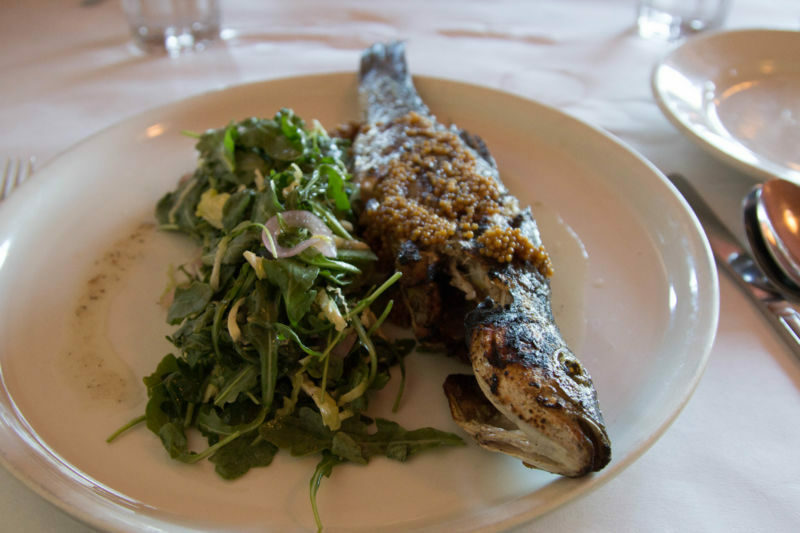 Having visions of the Branzino at Chianti Osteria, I was excited at the idea to have it again. We had been wine tasting, so I decided against ordering a glass of wine. It was just water for me on this occasion. 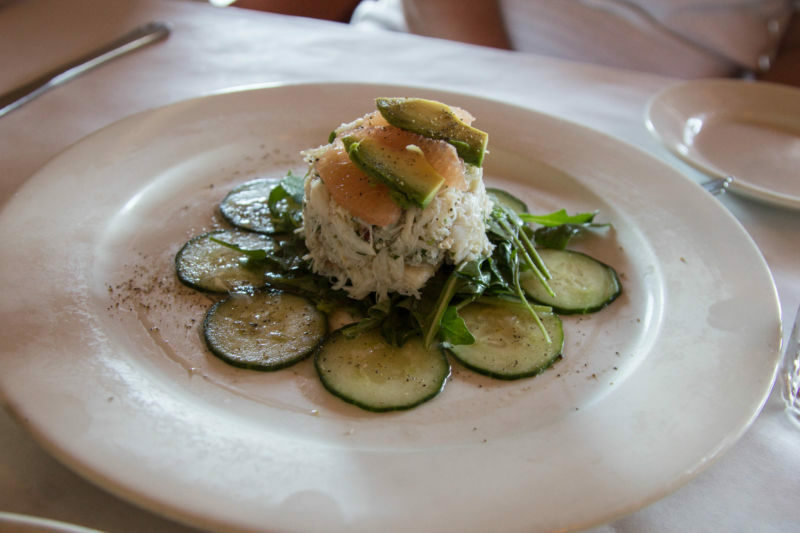 Our guest, who again tried to shame the table with her healthy eating habits, ordered the crab salad as her main meal. We saw it on another table and it looked really good. It seemed cool and refreshing to her on a hot day. The Brit ordered the skirt steak. I had that on my mind too, so I was glad when he ordered it knowing I could steal a bite or two. When our plates arrived, they looked very appetizing. My fish was served whole on the plate and the flesh was exposed to eat. It came with a small side salad of dressed mix leaves with red onion and brussels sprouts shavings. The fish was really nicely cooked, but the salad just didn’t do anything for me. The flavor was just not right. Similarly, our friend’s plate did look beautifully presented, but it missed the mark by a big margin. The crab salad was sitting in a pool of crab juice. So much so, that she couldn’t really taste the dressing and all of her lettuce was wilted and flat. She was very underwhelmed. The Brit’s plate looked great. 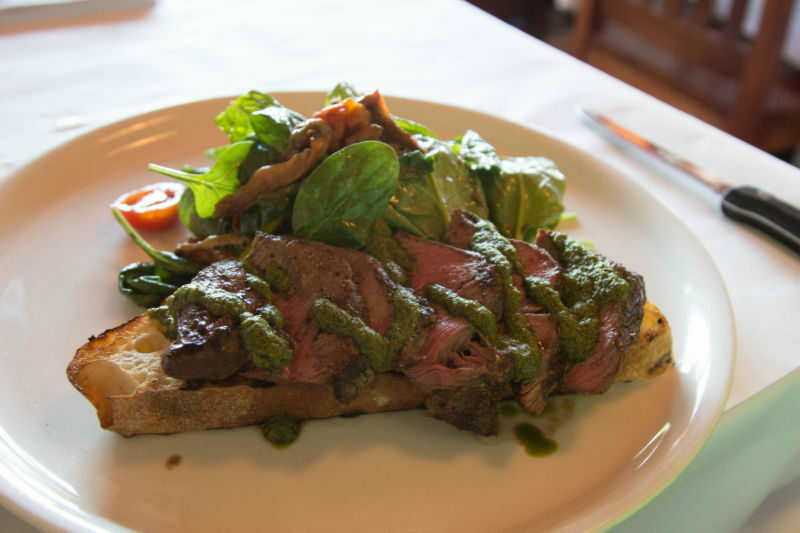 The flat-iron steak was cooked beautifully and served on toasted bread. It was finished off with what looked like chimmichuri sauce, but it didn’t taste like any version of that sauce I had ever had. To my palate it wasn’t that pleasant either and did zero for the steak. The salad was the best out of the three examples but still was only meh in flavor. The Brit comments: The fact that I thought the salad was the highlight of the dish is a clear sign that the steak underwhelmed. The sauce was not bad, but neither did it add to the dish in the way you would wish a sauce to do. None of us cared enough to eat their dessert. We were all disappointed in the food and really didn’t want to be disappointed by another fail. We went home and I ended up serving cheese and fruit at home. I don’t want to slam this restaurant, but the food simply wasn’t great. I have said this on a couple of occasions; if you want to make it in Napa, with all the competition, you have to bring your A game. After talking it over, we decided that there are too many other places to eat in the area to bother to return and get such an underwhelming meal. The Brit comments: I did order a glass of wine with the meal. When the food arrived, my wine had not, so I had to remind the waiter. To add insult to injury when I was presented with the bill, I had been charged for two glasses of wine. As California Girl says, there was no single culinary disaster, but a cumulative disappointment.